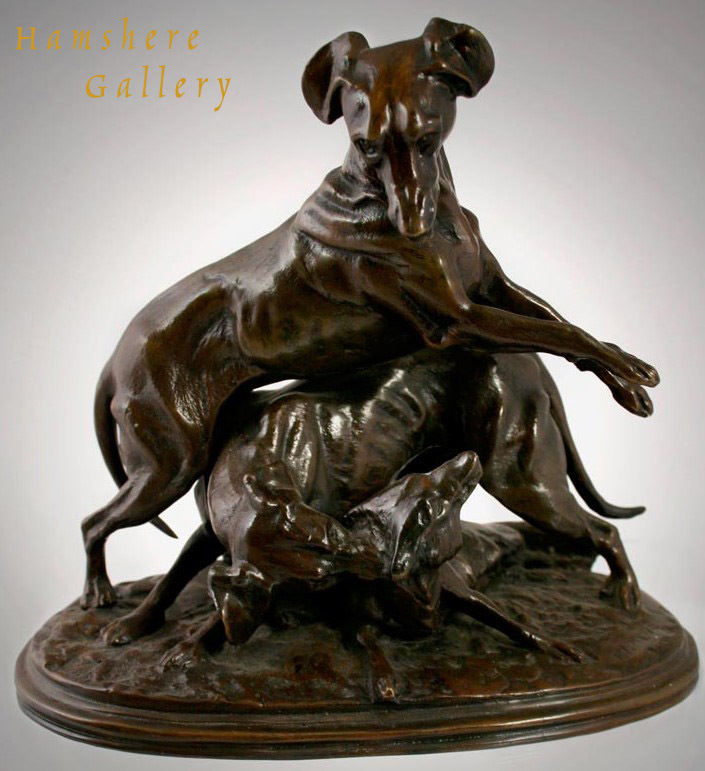 The Whippet titled "Vic" by Gertrude Massey (1868-1957) signed "Gertrude Massey". 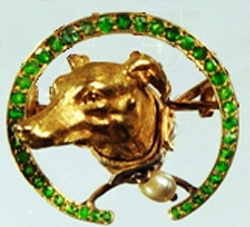 Set within original gilt-metal frame with pierced ribbon crest. 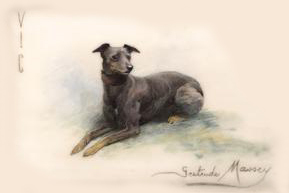 "A Casualty" was exhibited in 1900 at "The Fine Art Society's", New Bond Street, London "Exhibition of Miniatures of Dogs by Mrs. Gertrude Massey". English, circa 1900. Provenance by family descent. Silk scarf “Made in France” by Hermes designed by Xavier de Poret (French, 1894 - 1975) for his scarf first issued in 1956 and called “Les Levriers”, GreyhoundS. 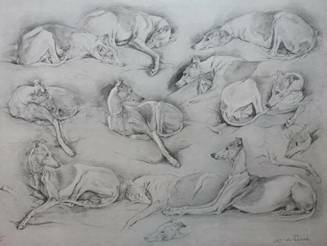 It is said that when Mrs Peggy Stancomb of Tinribs Whippets was living in Paris she bought most of the scarves as presents! This was the design Hermes commissioned for their silk “Les Levriers” 1956 scarf range that came in six colour variants. 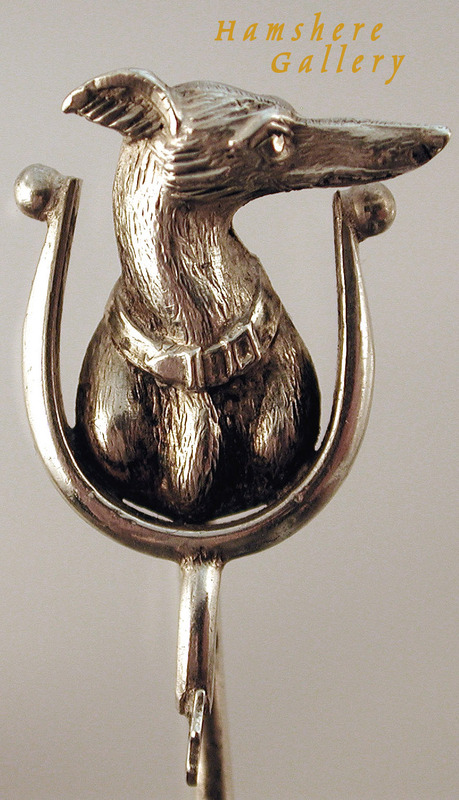 Greyhound/ Italian Greyhound/ Whippet silver stick pin mounted as a head and shoulders study within a riders spur. English, circa 1900. 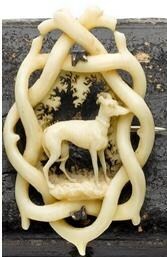 A "Black Forest" ivory carved Italian Greyhound / Whippet running through forest setting. Stained detailing. Such carvings were from German workshop of the Graf von Erbach-Erbach in Odenwald, and the Kehrer family at Erbach, Ernst (working 1830-40) and his son Edouard (1812-63). They were made from around 1830 to 1860. German, circa 1860. 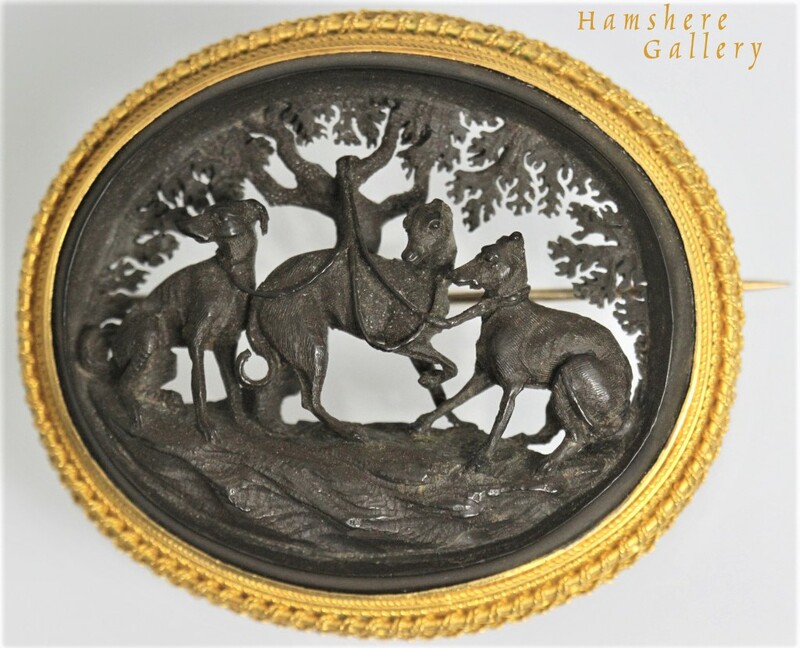 An extremely and intricately carved bog oak and gold brooch, depicting three Whippets / Italian Greyhounds leashed beneath a leafy tree. Set within a very fine 18 carat gold mount. English, circa 1960. “Les Levriers”, Hermès red boarder / colourway silk scarf of Whippets / Italian Greyhounds / Greyhounds after Xavier de Poret (French, 1894 - 1975) .